This is a list of notable ramen dishes. 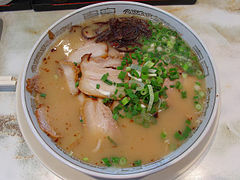 Ramen is a Japanese dish that consists of Chinese-style wheat noodles served in a meat or (occasionally) fish-based broth, often flavored with soy sauce or miso. 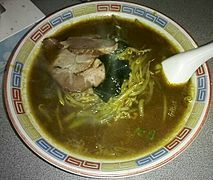 Ramen dishes often include toppings such as sliced pork (チャーシュー, chāshū), dried seaweed (海苔, nori), menma (メンマ, menma), and green onions (葱, negi). Nearly every region in Japan has its own variation of ramen. Ramen shops are restaurants that specialize in ramen dishes. 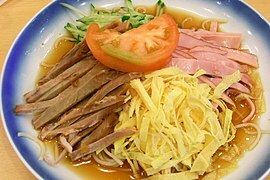 Champon – a ramen dish that is a regional cuisine of Nagasaki, Japan, different versions exist in Japan, Korea and China. 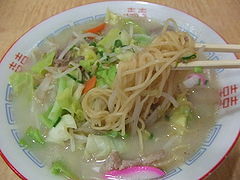 Champon is made by frying pork, seafood and vegetables with lard; a soup made with chicken and pig bones is then added. Ramen noodles made especially for champon are added and then boiled. Unlike other ramen dishes, only one pan is needed as the noodles are boiled in the soup. 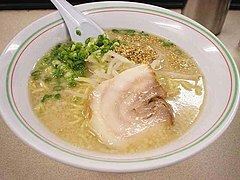 Hokkaido ramen – many cities in Hokkaido have their own versions of ramen, and Sapporo ramen is known throughout Japan. Kagoshima ramen – a ramen dish offered in the Kagoshima Prefecture in southern Japan, it is mainly based on tonkotsu (pork bone broth). It is a little cloudy, and chicken stock, vegetables, dried sardines, kelp and dried mushrooms are added. Muroran curry ramen – a curry flavored ramen noodle dish that is provided at many ramen restaurants in the cities of Muroran, Noboribetsu, Date, and Tōyako in Hokkaido, Japan. Tonkotsu ramen – a ramen dish that originated on the Kyushu island of Japan, its broth is based upon pork bones. Tsukemen – a ramen dish in Japanese cuisine consisting of noodles that are eaten after being dipped in a separate bowl of soup or broth. ^ Satterwhite, R. (2006). Tokyo. Good food guide. Marshall Cavendish International (Asia) Private Limited. p. 42. ISBN 978-981-232-919-6. Retrieved May 16, 2017. ^ Mac, Brian (October 8, 2014). "Adventures in ramen: Japan's soup scene". CNN. Retrieved May 16, 2017. ^ Aye, M.M. (2014). Noodle! : 100 Amazing Authentic Recipes. 100 Great Recipes. Bloomsbury Publishing. pp. 48–49. ISBN 978-1-4729-1061-5. Retrieved May 16, 2017. ^ Heiter, C.; Press, T.A. ; George, R. (2009). To Japan with Love: A Travel Guide for the Connoisseur. To Asia with Love. ThingsAsian Press. p. 34. ISBN 978-1-934159-05-7. Retrieved May 16, 2017. ^ Orkin, I.; Ying, C. (2013). Ivan Ramen: Love, Obsession, and Recipes from Tokyo's Most Unlikely Noodle Joint. Ten Speed Press. p. 169. ISBN 978-1-60774-446-7.